Mini dosas are my favourite dish right from my childhood. I still remember, as kids how much my sister and I loved this. Mom used to make this spongy mini dosas during dinner only. That is because she could do it leisurely. Most of the times, we used to have our dinner in the open space in front of the house under moon light. I always loved to have them with sugar & ghee. We enjoyed listening to our grandma's stories while relishing these dosas. We had even named it as "Ambuli dosai". In tamil, Ambuli means "Moon". I'm not sure, why we called it so!! ( May be for the shape or we ate them under moon light) The colorful mini dosa is healthy too as I'v utilized the natural colors of vegetables. 1. For green color, take small quantity of batter and grind it with coriander. 2. For orange color, take small quantity of batter and grind it with tomato. 3. For light yellow/sandal color, cook carrot and then grind with batter. 4. When ready, make small spongy dosas. I love your veg doll!Can I take it home! so colorful that no kid could resisit this :-) Grt idea Nithu ! very very cute and lovely mini dosas with a beautiful artistic presentation. wow..these mini dosas r so cute! n that doll is cuter!! wonderful presentation..
Love those colourful dosas.. not only kids adults will be attracted. So cute mini dosas, looks yumm....kids will definitely love this.. Very nice and how exciting to be sitting by moon light and eating them.. wonderful! awwwwwwwwwwwwww...very cute dosa..keeo looking them...very colourful..
looks so cute and prefect for kids!! 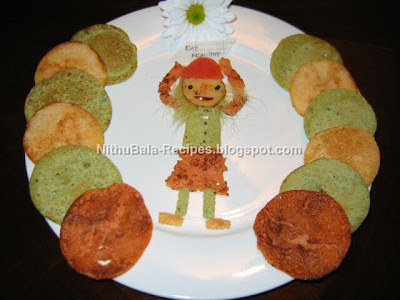 Dosas look very cute and yummy, doll holding eat healthy msg looks very very cute. Very creative Nithu, sure kids will love this. So cute presentation! Kids would love these mini delights! Nithu perfect dosas loved the girl dosa too...thanks dear for your creative entry for the event. That sure was a wonderful idea. Looks tempting too. Loved the presentation. Colourful dosas and the doll looks lovely .A treat for the kids. That looks so yummy and adorable. I love your presentation! Thanka lot for visiting my blog and following me...U have a fabulous space here and I am fan of simple and easy recipes..so will definitely follow u.
wow, so cute presentation..really love the recipe. This is pretty cool.. Vedant would love this, especially the way you have presented. Such a colorful presentation..Love this pic! எனக்கு பிடித்த பீட்ரூட்டில் செய்ய போறேன். Nithu, love the colorful dosa, like everyone says even mine will eat these colorful ones! Thanks for the entries.